We start with all natural evergreen trimmings, bundling them together and binding them to a wire wreath form. Our team of talented wreath creators can honestly be called artists, combining different evergreens and accents, like pinecones and ornaments, results in an unbelievable work of art. And each detail is crafted completely by hand. Check out the video below to see the whole process in action! Totally incredible, right? And he made it look so easy! Well, trust us, it’s not as easy as it looks. 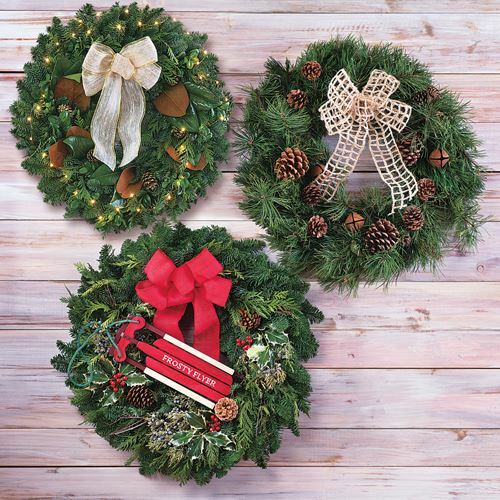 Jackson & Perkins makes some pretty astonishing wreaths that are fully decorated with berries, ornaments and even snow frosting! There are countless styles to choose from, and each wreath you receive is handmade, designed by the hands of an artist and crafted with care.